Director of Projects Abroad PRO, Scott McQuarrie tells us about the latest developments. "Over the course of 2010 we have been developing our new skilled and qualified arm called Projects Abroad PRO. The main focus of Projects Abroad PRO is to connect professional volunteers with project partners in the developing world who will find a practical use for their skill. This concept has taken numerous forms in 2010 – we have successfully placed a physiotherapist at a Burns Unit in Bolivia, a management consultant at a local NGO in Romania and several lawyers helping at our Human Rights office in South Africa. In total we have received 105 professional volunteer applications. 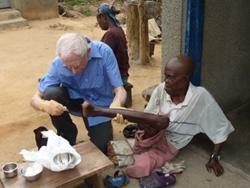 Each volunteer has played an important role overseas. As a result, we have focused our efforts on partnering volunteers with local professionals who deliver unique cultural awareness. I would like to thank everyone who has made a contribution to Projects Abroad PRO in 2010, especially our volunteers. I would also like mention the tireless work of our in-country Directors who are always quick to react regarding potential projects for skilled volunteers. Their advice and support has seen the introduction of new projects such as our Microfinance project in Tanzania and Water & Sanitation project in Bolivia. Their input means skilled volunteers receive the most up-to-date information prior to applying and comprehensive support when they reach their destination. I look forward to collaborating with more volunteers, partners and colleagues in 2011."